There’s no stopping Steph Gray over at DIUS. Last week it was a ‘commentable’ White Paper, driven by WordPress. 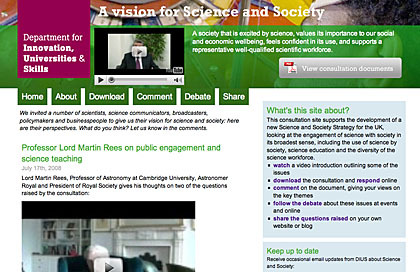 Today, they’ve launched a remarkably deep consultation site on Science and Society. In his writeup, Steph is kind enough to quote my own work for the Ministry of Justice’s Governance of Britain as an inspiration. But he’s taking things at least one significant step forward. As with Governance (and indeed the new No10 site), there’s heavy reliance on third-party services, like YouTube and del.icio.us, with content being pumped in automatically via RSS. Steph’s following the Governance idea of using ‘famous name’ video clips to kick-start debate in the form of blog comments: both sites are in their earliest days, so we don’t have any meaningful evidence about its effectiveness yet, but it feels like a good way to work. PS: Remember PlaySpace, the DCSF SimCity-esque consultation game? JonW wondered how much it cost; the answer’s in Hansard (well, TheyWorkForYou) this week. Good as the app is, there’s no getting away from the fact that £50,000 is a lot of money for a three-month consultation exercise. Pingback: Socialreporter | Social innovation is happening: will Government join in?